South of Tasersuag Lake and east of Tasiusaq Fjord, oriented north-south, is a valley about 15 kilometers long that contains the only natural forest in Greenland. Qinngua Valley is protected on either side by tall mountains nearly 5,000 feet high that shields the valley from cold winds coming off the interior. The sea itself is 50 kilometers away. This creates a warm climate favorable to trees such as the downy birch and gray-leaf willow. The lack of strong winds allow the trees to stand up straight. Some of the trees here grows up to 20-25 feet tall. 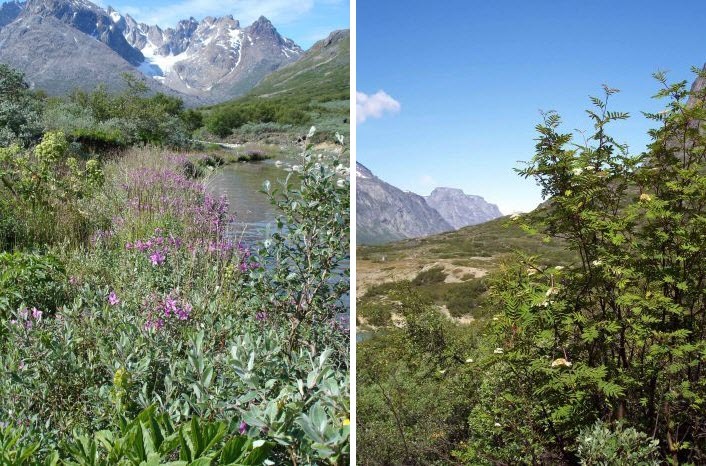 Altogether, over three hundred species of plants grow in Qinngua Valley. In earlier times, Greenland had a much warmer climate, and trees and plants were much more widespread than they are today. Scientists have drilled holes into Greenland’s two-kilometers-thick glacier and have found plant DNA as well as remains of spiders, insects and butterflies beneath the ice, suggesting that certain regions in southern Greenland was a veritable paradise half a million years ago. Due to its mild climate, the area around Qinngua Valley was also the first to be settled by the Norse in the 10th century. There are ruins of a large Norse farm near the coast which some claim is Brattahlíð, the estate of Erik the Red, who founded the first Norse settlement on Greenland. It was Erik who named the island “Greenland” as a marketing ploy—Erik believed that calling this icy wasteland “green” would encourage others to follow. The similarly deceptively named “Iceland” is another one of Norse’s doing. Iceland’s Viking settlers thought that a morose-sounding name would keep out other settlers looking to settle in new lands. They wanted to keep all of Iceland for themselves. The settlement at Brattahlíð survived for 500 years, and was abandoned in the 15th century most likely due to the cooling of Greenland. 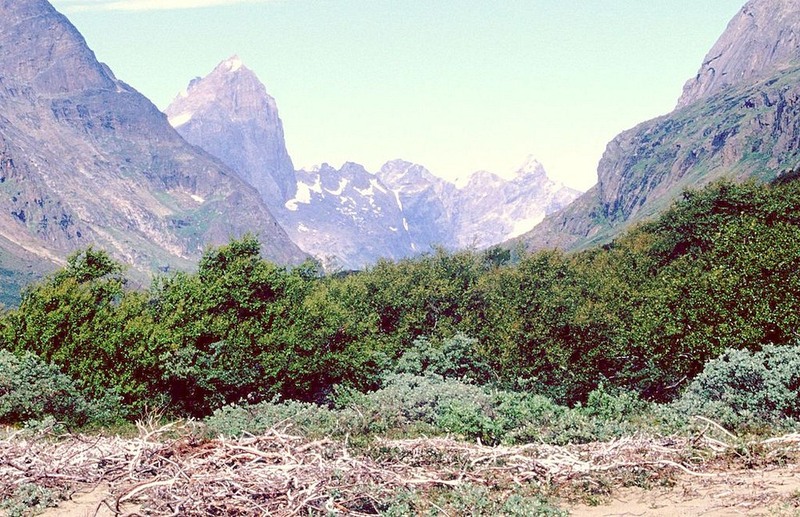 The Norse settlers contributed to the degradation of Greenland’s environment as well, stripping the island bare of its natural forests for building homes and ships. Overgrazing and the removal of turf for construction caused rapid erosion of what was once pasture areas. Today, Greenland has one of the lowest biodiversity in the world. There are only 700 species of insects in Greenland against one million found in the rest of the world. Although the sea around Greenland is rich with marine life, land mammals of Greenland are restricted to only a handful of resilient species such as the polar bear, reindeer, arctic fox, arctic hare, artic wolf and musk ox. There are no native or free-living reptiles or amphibians on the island. Plant diversity is lesser still—only about 500. The only flora the island is rich in are lichens, fungi, mosses and algae, with several hundreds species of each.